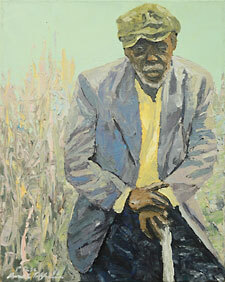 This painting graced the printed Gallery Walk guide's February cover. "My art is a calibration of lives past for their contribution to the human experience. Although many of the people I paint are not famous or well known, deep in our souls we connect to them. They lived their lives as we live now, and they have been where we are yet to go." 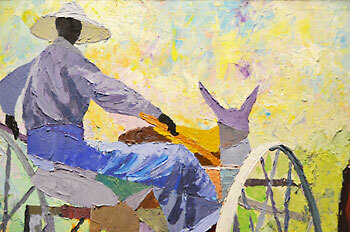 Born in 1957, in West Chester, Pennsylvania, about twenty-five miles outside of Philadelphia, Dane E. Tilghman would become one of America's most sought-after African American artists. His passion for art began at the age of four or five, when he began mimicking his older brother's drawings and eventually began drawing "all the time." Later, at Conestoga High School in Berwyn, he was in an art program that met for four periods every day, and went on to earn a Bachelor's degree in Fine Arts at Kutztown University. He had focused in Graphic Arts "because my teacher in high school told me that since [there was no guarantee of] making a living in art, graphics was the way to go," but he never liked it. 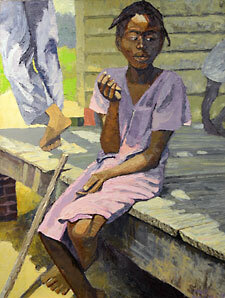 This Tilghman is entitled "The Help." Dane's palette varies a bit depending on which subject matter he is painting -- 1930-1940s era as compared to his sports, jazz, and blues series. "I work in mainly four different styles: Impressionism, Realism, Cubism, and a style that I like to call Tall Tale Art." When it comes to the nostalgia of bygone times, "I am working from black-and-white photography as my 'jump-off' point or reference material.... I duplicate the scene in my head [and] am making up colors as I go along. As an artist, I have the freedom to use very bright colors, but it would not represent the people well.... I keep those colors toned down, more realistic, maybe more impressionistic. However, with sports and music themes, it is more expressionistic, and bright colors just go with the flavor of the work." Dane has taken his artwork towards new dimensions, going from realism to a stylish combination developing his own interpretations of surrealism and primitive elongation. Dane has exhibited his work throughout the United States at art festivals, galleries, trade shows, convention centers and sports arenas, where he has received numerous awards. 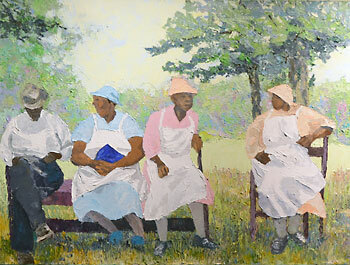 His work has been exhibited at the African American Museum in Philadelphia, and also in one-man shows at Howard University, Widener University, West Chester University, University of Pennsylvania, Penn State, and the Butler Institute of Fine Art in Youngstown, Ohio. One of his baseball images has been incorporated into the Baseball Hall of Fame Museum in Cooperstown, N.Y., and he created an 8x40-foot mural for Turner Stadium in Atlanta. Two framed Tilghman reproductions were given to Nelson Mandela by the Black McDonald's Association of Philadelphia just a couple of years after Mandela was released from prison. "That was a tremendous honor for me!" confirms Dane. Other notable collectors of his work have included Ossie Davis, Bill Cosby, Dave Winfield, and corporations including Nabisco, Prudential, MBNA, and Astra-Zeneca. In 2004, Kutztown University, Dane's alma mater, commissioned him to design a commemorative poster celebrating the 50th Anniversary of Brown versus the Board of Education. Other interests in Dane's life include motivational speaking. "That and ministry are still in me. I am not talking about in the pulpit or on top of a soapbox. I just want to be able to speak and make a difference." Also, a few years ago, after a lifetime of singing in church, Dane and a few friends took up singing at open mike nights. "None of us has another fifty years in us, so we decided we might as well have fun in the time we have left." 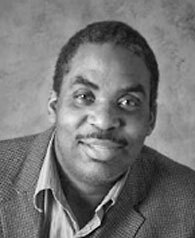 Whether painting, singing, or speaking in public, Dane Tilghman is assuredly an inspiration to everyone touched by his artistically rich spirit.